The HS400A's built-in MultiViewer can output 4, 8, or 10 images from different sources to a single high-resolution display, eliminating the need for multiple HD source and preview monitors. New Multiviewer features include custom and menu selection of window labels, and enhanced control of labels, borders, and label background. For added creativity, the switcher offers a wide selection of wipe patterns including 3-D digital effects (such as Page Turn), and features a high-quality chroma key for green screen applications in broadcast and production. As a compact, all-in-one mixer system, the HS400A easily integrates into existing HD/SD workflows, flawlessly mixing HD and SD video sources. It comes standard with eight HD/SD-SDI inputs and four HD/SDI outputs. 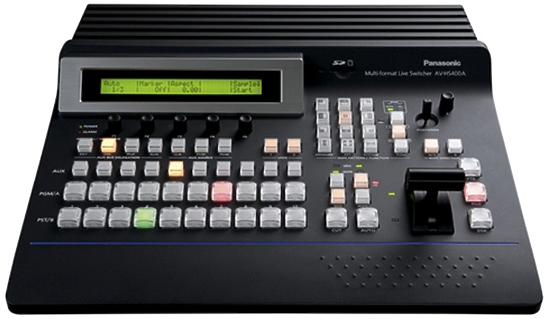 The switcher has a built-in, switchable 10-bit frame synchroniser for each input, for glitch-free switching, even with non-synchronous sources such as Blu-Ray DVD players or remote camera feeds. Hire the Panasonic AVHS400A Vision Mixer from Procam. Best service and rental rates for the Panasonic AVHS400A Vision Mixer and all cameras, lenses, sound, lighting and grip.